Update April 13, 2018: SpyParty is available on Steam Early Access now. This is exciting because it’s been in development for almost ten years, only occasionally showing a glimpse of its intriguing premise. But now SpyParty, a tense one-on-one game of spy versus assassin, is ready for you to try. Perhaps someday SpyParty will make our list of the best indie games on PC. If you’ve missed out on the SpyParty details so far, the game sets two players against each other. 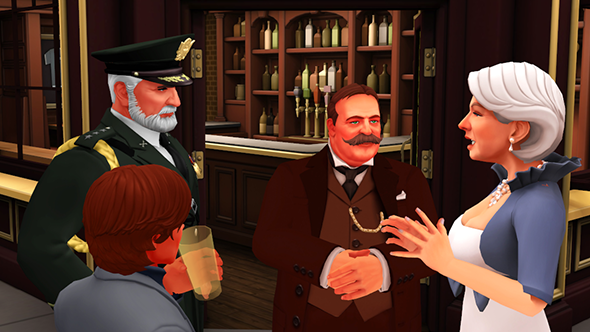 A spy has to blend in with NPCs at a cocktail party while completing specific objectives, while a sniper watches from afar in an attempt to pick out and kill the spy. It’s a unique concept, and one that’s been a delight every time we’ve played it. Head to the Steam page here to give it a tryfor £19.49 ($24.99). Read our previous coverage below for what’s new with the Early Access launch. Update, April 4, 2018:SpyParty comes to Steam Early Access next week. SpyParty’s been kicking around trade shows, conventions, and various parts of the internet for the better part of the last decade, and it’s finally about to come to Steam. The one-on-one, high stakes game of cat and mouse is set to launch on April 12 in Early Access. Along with the launch, the game’s getting six new levels, already available in the version on the official website. It will also launch with a fancy new tutorial and matchmaking. No word on whether the price will change on Steam, but current version of SpyParty is $15 USD. Original story, November 23, 2017:SpyParty has two players. The Spy infiltrates a party and attempts to blend in with a group of NPCs while completing objectives like planting bugs or swapping evidence. The Sniper watches the room from afar and tries to pick out who the Spy is so they can deliver the killing shot. If that sounds familiar, it’s because SpyParty has been in varying states of development for most of the past decade, but it seems the game might actually be inching closer to release soon. A new trailer went up two days ago, and in the comments developer Chris Hecker says that he’s “hoping to it up on Steam Early Access early next year.” Before it goes up, it apparently needs UI work, a tutorial, matchmaking, some load testing, and Steam account integration. There’s also now a Steam page laying out Early Access plans. This is practically a real video game. One thing will remain true no matter the year, and no matter the age in which we live: SpyParty is about two years from being done.